It’s that time of year again! The summer is winding down and it is time to start getting the kiddos ready for a brand new school year. I’m sort of at a crossroads on how I feel about this. Back in January, I was sure I was going to be yearning for the school year by now, but the boys have surprised me this summer. Oh, we’ve had our moments, and when they start bickering I get that twinge of the beginning of yearning, but for the most part it has been a wonderful summer. The boys haven’t bickered too much, Liam has been awesome at respecting when I or Travis or both are busy, and he waits until we’re finished what we’re doing. All in all, I think I will be sad when this summer ends. End it must though, so I’m starting my preparations for the new school year, and those preparations begin with my Back to School Printables. 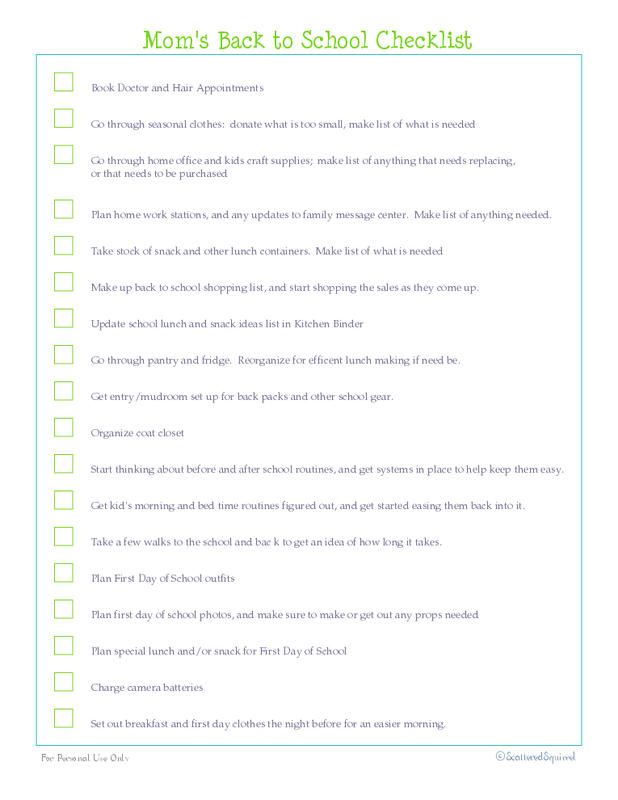 First up, the Back to School Checklist. Last year this check list was a life saver for me. Between moving, unpacking, and everything in between this helped to keep me on track and not forget to make sure we were prepared for the coming year. With the to do’s taken care of by the above checklist, I needed something to keep track of all the items we needed to buy for the coming school year, and that’s where this planner page came in. Here’s a quick overview on how I use this one. to keep track of what we already have, what we need and what I want for the home. Knowing what we already have means we’re not tempted to buy more. (unless it’s for a fabulous price, and is something we know will get used, like paper) I also included what I want for the home, because this time of year is the perfect time to snag some great deals on items for the home office. Clothing and sizes. The kid’s are not always with me when I’m out shopping. Know what we need and in what size means I can take advantage of sales when I see them. The miscellaneous section is for the standard items I know we’ll need (except school uniforms) these are items that might not need to purchased every year, but are still needed. 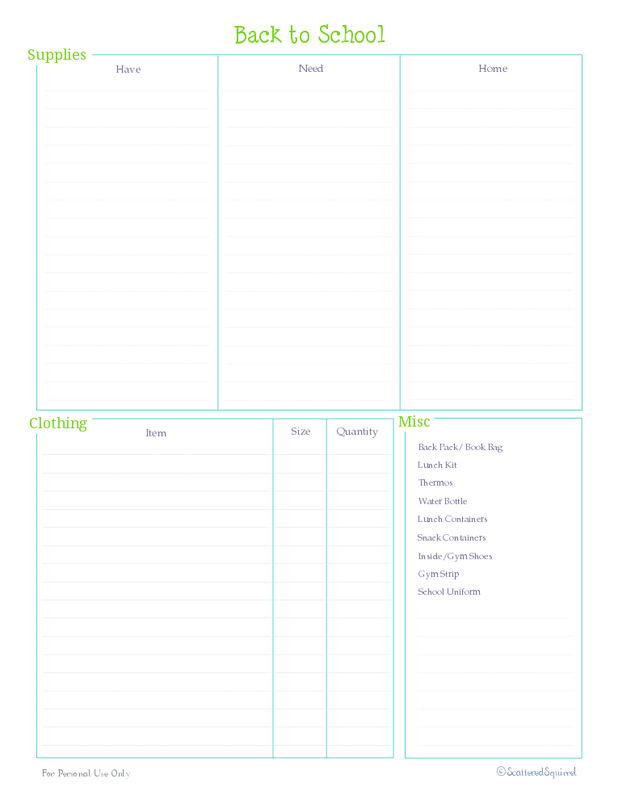 This printable kept me on track when it came to the shopping. I love back to school shopping, and not just for school supplies, but home office supplies as well. Now is the perfect time of year to stock up on pencils and pens and paper for yourself and your home. These next printables are from the Kid’s Section of my HMB. 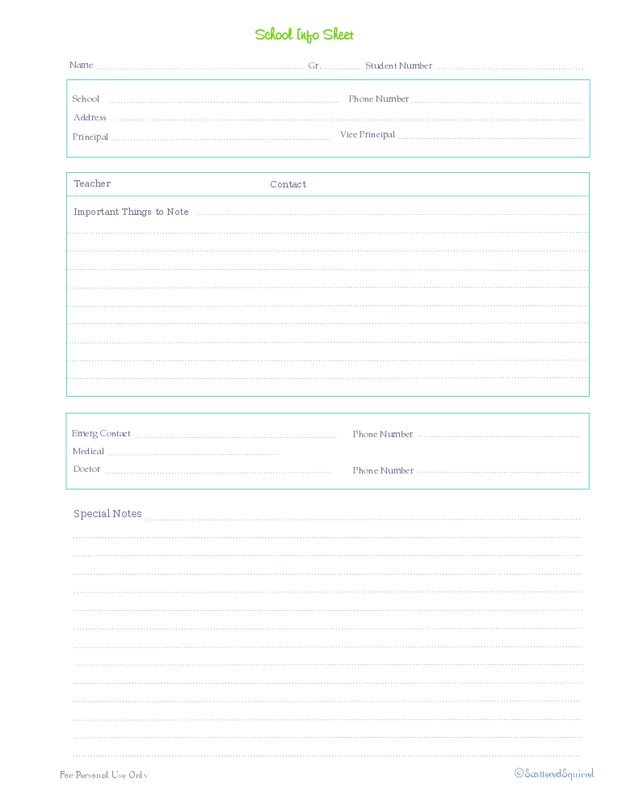 I print a new one each year to make sure I have current contact info for teachers, schools, and other important information that changes from year to year. 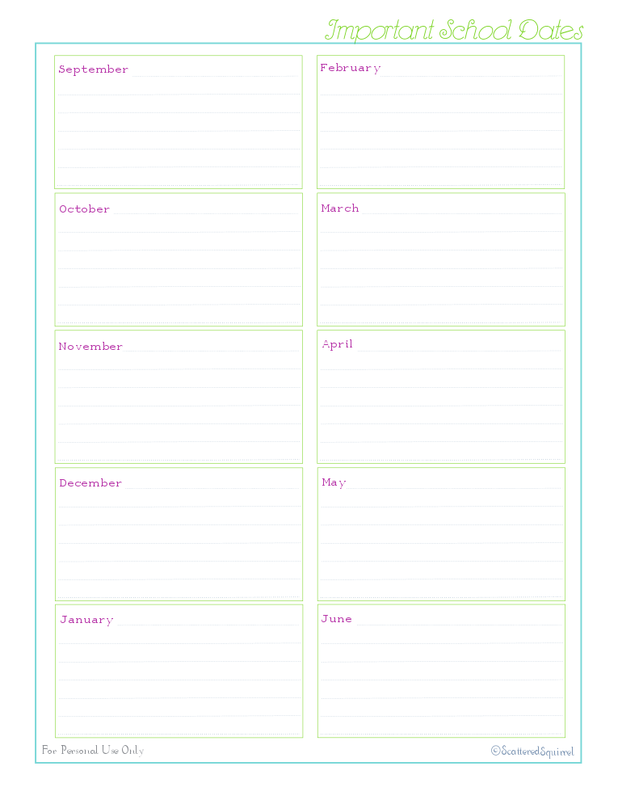 And of course new copies of the Important School Dates printable can’t be forgotten. I print two of these because we have one boy in *sniffle* high school and one boy in elementary school. School dates rarely match up, and as I discovered last year, having one for each of them works well for us. This one came about thanks to a Reader Request. 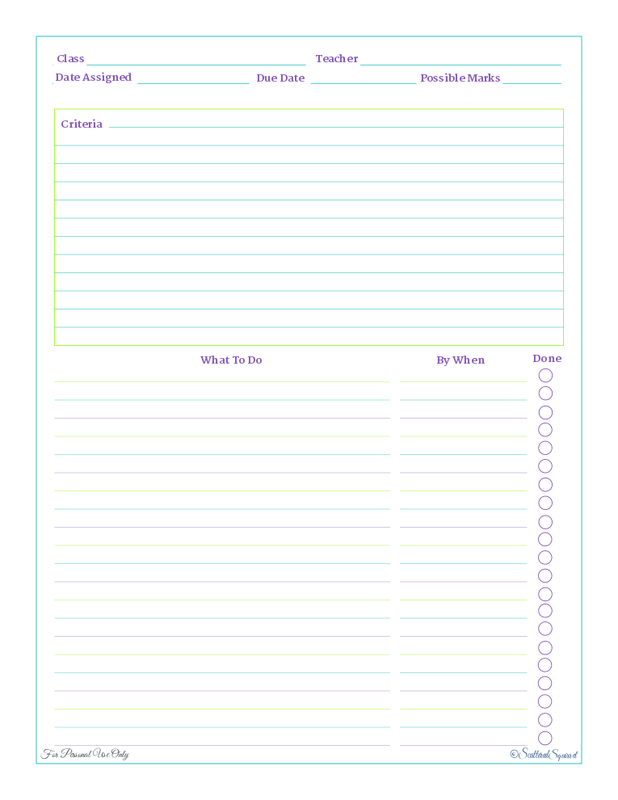 The idea was that a student could use this planner to help stay on track with larger projects. We haven’t used this one yet, our teen prefers to do things in his own way, but my friend’s niece loved it so much she printed out a bunch of them so that she’s always prepared when a big project gets assigned. Now that I’ve got these all printed out, I’m ready to start tackling some of the other back to school items on my list. From the fun stuff, such as shopping the back to school sales, to the not so fun stuff, such as doctor’s appointments and getting the boys (and myself) back into our school year routines. Thankfully, I still have a few more weeks to savor and enjoy the uncomplicated, unhurried, and unscheduled joys of the season. As always, to grab a copy of any of the printables just click on their pictures. Are you getting ready for the school year too? Are you eager for school to start, or do you wish summer vacation could linger just a little longer?